The public health threat posed by obesity in the UK is a "potential crisis on the scale of climate change", the health secretary has warned. Alan Johnson said the magnitude of the problem was becoming clear for the first time and "it is in everybody's interest to turn things round". Details have emerged of a government study which says half the population could be obese within 25 years. Ministers are drawing up a long-term action plan to tackle obesity. The government-commissioned Foresight report is expected to report on Wednesday. It suggests the cost of the epidemic, in terms of health care provision and lost work hours, could reach £45bn a year by 2050, according to the Observer. Professor Klim McPherson, of Oxford University, and Tim Marsh, of the National Heart Foundation, predict that within 15 years 86% of men will be overweight - but not necessarily obese - and within 20 years, 70% of women. The study showed there had to be "further and faster" efforts beyond existing anti-obesity measures to encourage exercise and healthy eating, Mr Johnson said. Prime Minister Gordon Brown has backed a long-term action plan to fight obesity, funded by money earmarked in Tuesday's Comprehensive Spending Review. The government is also due to ask the Food Standards Agency to probe the use of unhealthy "trans-fats", which have been linked to coronary heart disease, in fast food. But Mr Johnson said individuals also had to take responsibility for their own health as part of a "cultural and societal shift". He said: "There is no single solution to tackle obesity and it cannot be tackled by government action alone. "We will only succeed if the problem is recognised, owned and addressed at every level and every part of society." 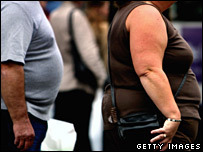 Public Health Minister Dawn Primarolo told the BBC that a longer term view needed to be taken of the obesity issue. She said: "The government has been doing a lot already in terms of healthy foods in schools, sports activity in schools, labelling of food, working with young people. "This report was part of the development of our strategies. "But... if we don't act, what will happen in health terms for individuals and for our communities in 10, 20 years' time is really something we that we need to face up to, and that means looking at everything." Dr Colin Waine - who chairs the National Obesity Forum - said that in terms of its impact on society, the health threat posed by obesity "will hit us much earlier than climate change". He added: "We are now in a situation where levels of childhood obesity will lead to the first cut in life expectancy for 200 years. These children are likely to die before their parents."